Another day, another new book to read. 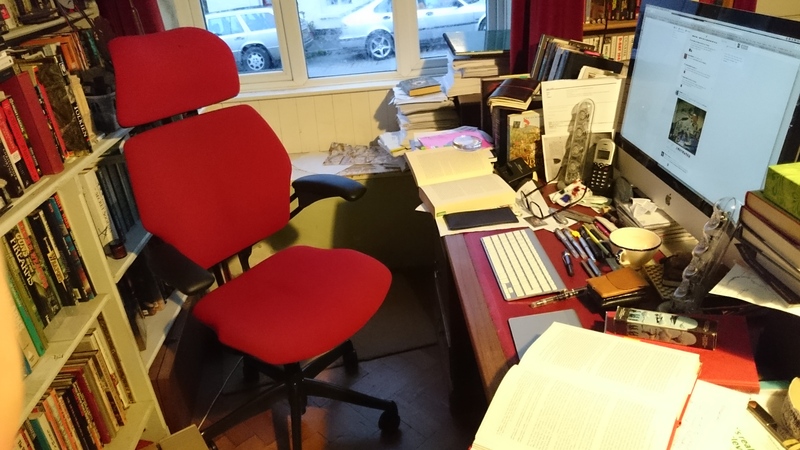 Writing reviews for books is growing to be rather more difficult. There are so many writers who have a reputation for ‘log rolling’, or puffing the books of their friends, that their words cannot be taken on face value. I’ve always had it as a firm policy that I wouldn’t promote a book I hadn’t read and liked. I don’t think there’s any need for more reviews slagging off a book that I don’t like. If other people want to deride people’s work, that is fine. It’s just not for me. Usually it’s a proof of a writer’s urge to write something, and often it’s a sign of jealousy: ‘This author got published, but it should have been me!’ I’ve had my share of rubbish reviews (not only my famous ‘I won’t buy this because the cover’s bad’, but some stinkers). The nastiest, I think, was the one that accused me of not being able to spell correctly. He (or she) was vile in the comments made about me, my command of English and ability to write. I, apparently, spelled ‘colour’ with a ‘u’, and compounded my crimes by writing ‘honour’ too. Then again, I spelled ‘traveller’ with the double ‘l’. Several other reviewers (thanks, folks) put in their fourpence-ha’penny to point out I was writing correct English, not American English. I was too polite to comment. Anyway, I don’t review books, pens, pencils, papers, or other items just because I happen to know the author, manufacturer etc. Usually I will write for the pleasure of helping a person or company that I like and respect or whose products I love. And I tend to do so here and on YouTube because I am a writer first and foremost, and because I can put together a video in about a half hour. It’s easy on the time. Some years ago I began to comment about pens, and at the time I was most keen to shout out about Conway Stewart for the simple reason that they were based only a few miles from my home, and I always have liked the idea of promoting short product miles, or whatever you want to call it. Basically, I believe that we should cut the use of energy in shipping goods where possible. So to me it makes sense to buy from a local supplier. The fact that Conway Stewart used resins and metals from all over the world probably means my rationale was not too strong, but you have to start somewhere. So, I bought a Conway Stewart and liked it so much I bought another. I even helped them create a new pen, which then was named after men. Nice – but as with all these things, I didn’t earn any money from the project. I was trying to help a small, local business. I really like Salt Rock, who make hoodies and sweatshirts. I like them so much that I have three of their jumpers and coats and I’m rarely seen out of them. I happen to like Cult Pens because I’ve been using them for years and I’ve found their range, their service and their pricing to be superb. I’ve met the two owners of the business, and their dog, and they like my books too, so there’s a little mutual admiration there, too. Both of these are Devon firms, and I am keen to promote and help them – but neither pays me, other than occasionally letting me have a product to review. I talk about and promote them both because they are exceptional companies with reliable and efficient service. Because I don’t get paid to review things, there’s no incentive to be dishonest. I rather like that. Books are different from other things you may want to purchase. The quality of a book is so subjective. The value of an author’s writing is very definitely formed as an opinion by the reader. One man’s red-meat reading is another’s poison. There are many books I do not like. I won’t tell you about them because there is no reason to. My reviews are just that: my personal reviews. You may have entirely different taste to me. And that is fine. Reading allows a writer to touch our minds more swiftly than a film. It is an entirely personal thing, to absorb a book. However, if there is something that particularly grabs me about a book, it may grab you too. And that makes it worth mentioning in case it’s something you’ll appreciate. So, to the latest review. 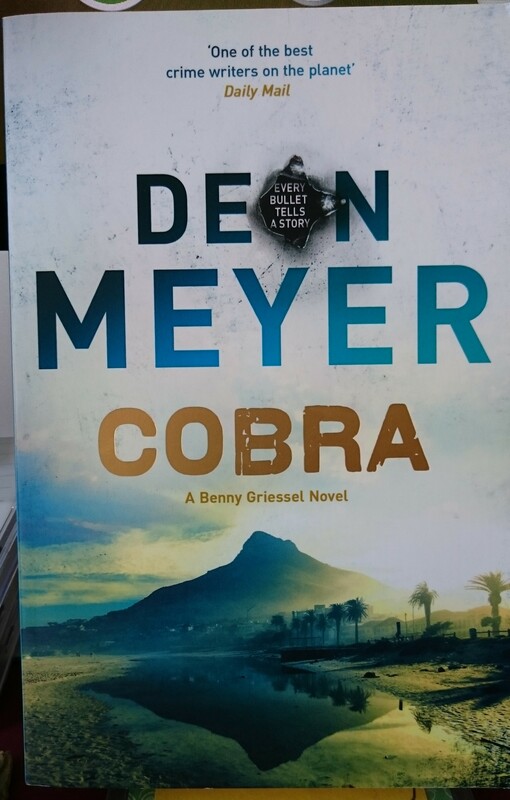 This is a book called COBRA, by Deon Meyer, published by Hodder at £7.99, ISBN 978 1 444 72377 9. And it’s highly recommended. I know of Deon Meyer. Some years ago I was given HEART OF THE HUNTER while I was in the US on a signing trip, but sadly didn’t have time to get into it. It’s actually here, now, in pristine condition, on my desk and I’m going to read it very soon, because I really loved COBRA. It starts out as, I thought, a rather standard type of crime book. A crime scene, some police officers, interesting clues including spent ammunition cases with a set of special signs on them, and the obligatory policeman who’s suffering from alcoholic withdrawal, loss of his wife, and trying to cope with the twin strains of a difficult, highly pressured job and a new relationship he doesn’t want to see disappear. Yeah, yeah – read enough books like that before. However, something kept me reading. Right, now, set all that last paragraph aside. I have to analyse why I loved this story. I have to try to be objective. Well, it has the delight of a new location. I love Africa. I used to go to Africa in the 70s and 80s, to Kenya, and grew to adore the country, the atmosphere, the history and everything else about it. But location isn’t enough to keep my interest going in a book. This has, I think, all the interest and excitement of CHILD 44 mixed with DAY OF THE JACKAL. It is a good suspenseful thriller, in other words, but includes the fascination of a fractured police team in a malfunctioning society. The new South Africa is beginning to fail, because of corruption and ever more draconian restrictions on civil liberties. Some of these police officers saw the end of Apartheid and believed in a new system that would give all a better life – and have to come to terms with the fact that their hopes and aspirations are being dashed. The power of the security forces is curtailing the freedom of individuals. Although the idea of a crime that cannot exist – as in CHILD 44 – is not there, the same hideous dilemmas strike the police when they try to investigate and are told that the security services want them to stop. With the full weight of the State weighing in against them, how far should a police officer go to try to do his or her job and enforce the law? And what value is there in a broken-down, middle-aged policeman from a past era? I found this book really superb. An excellent holiday read, but worth reading when you get back too! I haven’t met Deon Meyer, but I’ll certainly be searching out his books in future. First I have to read the one I was given all those years ago. And now, I have to get back to my own novel. This latest has another two weeks to go, with luck. Then it’s on with the next project. A great Elizabethan spy thriller. I’m looking forward to that. Thank you for the review. I have a weakness for dysfunctional police offers, such as Jo Nesbo’s Harry Hole and Phillip Kerr’s Bernie Gunther. This books sounds good to me. I saw the magic words, “Elizabethan spy thriller”. My favorite period of history so I am looking forward to that with great enthusiasm. Of course, after finishing the excellent “Blood on the Sand”, I am looking forward to seeing more of the vintaine, and wondering how Berenger Fripper will fare. I’m really glad you like the sound of Deon’s latest. I really rate it highly – but I’m happier to hear that you like Elizabethan spies. I need to sell my own books, not his! That is definitely my favorite era, and I like the sound of spies. You will have no trouble selling me that one! Negative reviews are something that I had to adapt my approach to after a publisher asked me to take down a review of a book that was sent to. I’d made it clear in the review that I was the wrong person to review it and steered clear of phrases like “utter rubbish” that I’d been tempted to use, but since then, if I’ve been asked to review something (or got it off NetGalley) and I don’t like it, then I won’t review it. However I will give a negative review to something that I bought but that’s rare. I know what I like and only tend to read those. The exception tends to be a few authors – Ellis Peters, MC Beaton & Ngaio Marsh mainly – where I’ve tried to understand the popularity of a series that just isn’t doing it for me. But even then I try and highlight why other people might like them more than I did. There’s too much negativity out there to add any more. Just realised I never replied to this! Apologies, Puzzle Doctor. You’ve written about my books often enough, I’ll understand if you hit one you don’t enjoy! Many thanks. Well if you recall, way back when, I was a little negative on the method of hiding the killer from the reader in The Tolls Of Death. But that was one iffy bit against many positives. But after going back to the start of the series, I’ve almost caught up so it’s getting re-read soon. Maybe I’ll change my mind. I think you’ve always been enormously fair. And TOLLS was a different book intentionally. I always try to keep the books rather varied, so that the reader never knows what’s coming with the next one. I have always been terrified of being accused of writing one book many times!